I’ve been having some fun with some waterproof fabrics. I bought several yards of this cute apple oil cloth (which is actually vinyl, not oiled cotton like old school oil cloth) and have been having all sorts of fun with it. 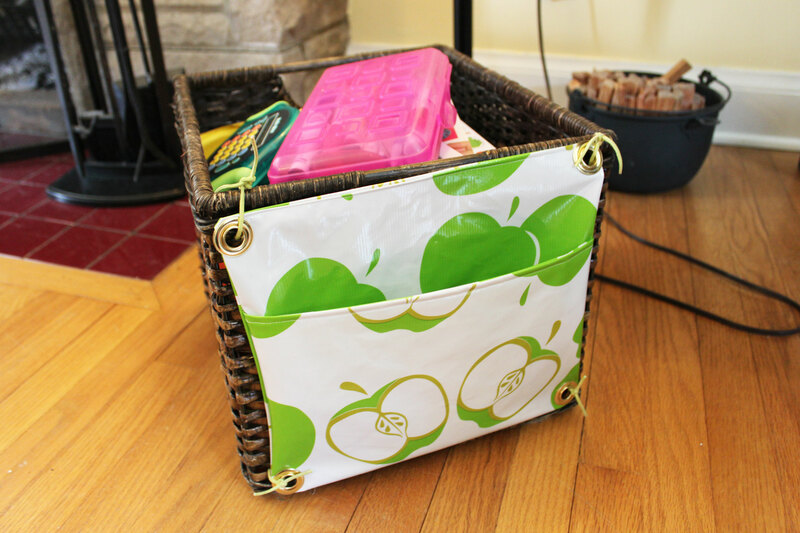 First I used it to cover the surface of my basement craft table and make a easy-clean surface under the kids’ easel, then I made this little pouch to attach to the outside of our homeschool bin. We have a few papers we need to access quickly or regularly, such as our agenda and our teacher/taught homeschool contract, so this pouch is for the storage and quick retrieval of those documents. 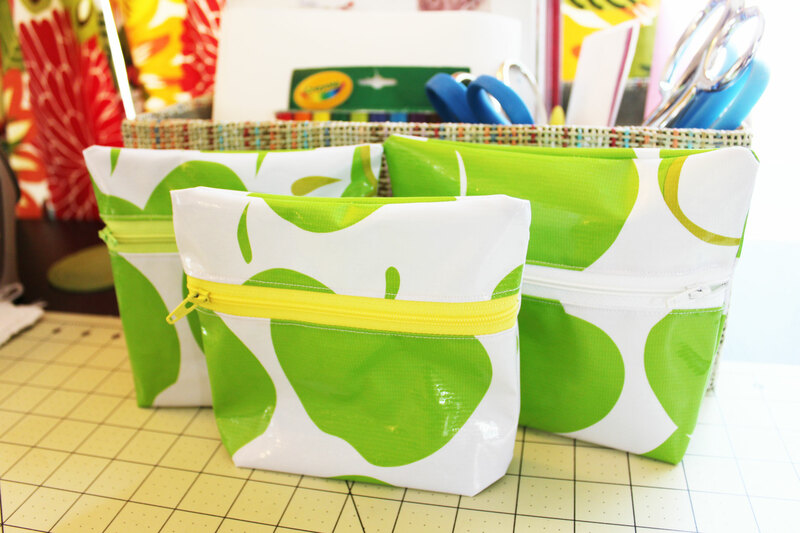 Then I made some zippered bags. Two are gifts for friends, and one got a grommet in the corner and is hanging by an S-hook to my homeschool pouch (above) to hold sticky notes and favorite pens. And since those little bags went together so easily and turned out so nicely, I got inspired to make this bigger waterproof bag to keep in my car door. It’s supplied with my waterproof zip-up rain hoodie, a grocery sack just in case we need it, and a small towel for the same reason. 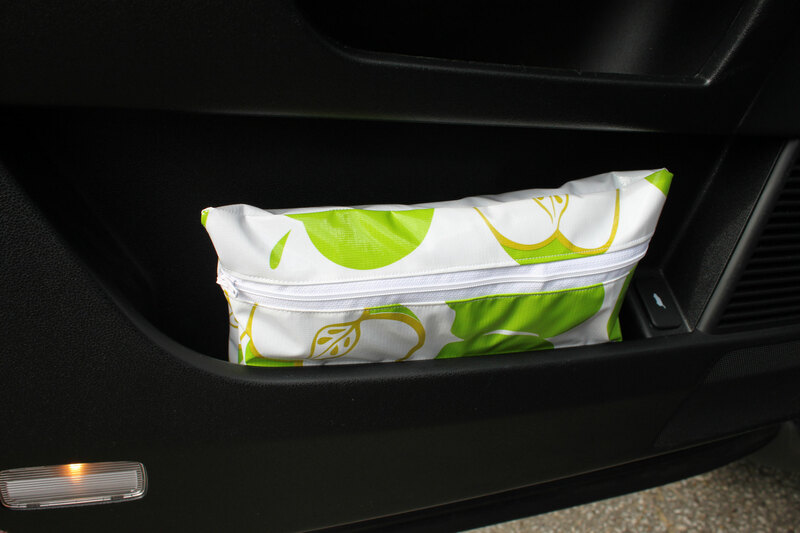 The contents won’t get wet if I open my car door in the rain, and it keeps all those sundries together in a handy and attractive way. I also recovered my kitchen chairs. These were covered in black and white polka-dot oil cloth (again, vinyl), but it didn’t wear well. The oil cloth split and got very worn around the edges after not all that much time. 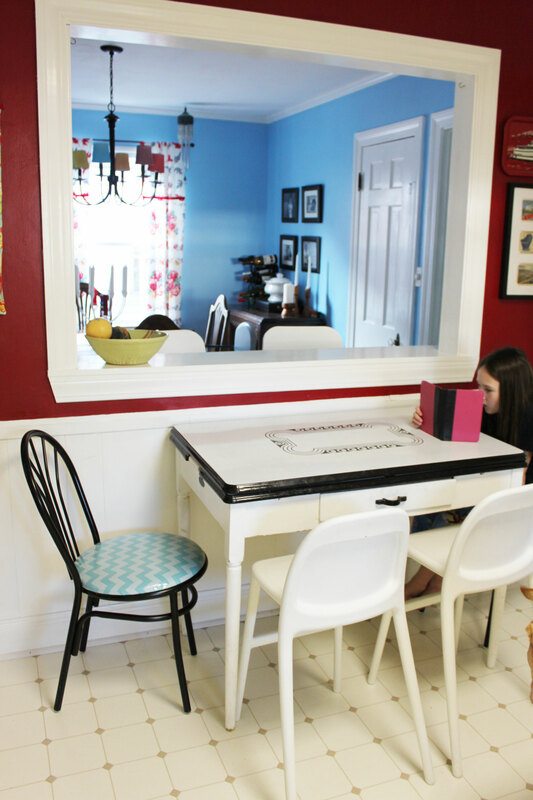 This time I covered the chair pads in laminated cotton, like I did for my dining chairs a couple years ago. I’ve had a great experience with the laminated cotton as chair seat upholstery fabric. It is comfortable, it wipes clean, it wears well, and it is easy to work with. I’m enjoying the pop of blue this new fabric is bringing to the room, too, in place of the black and white.